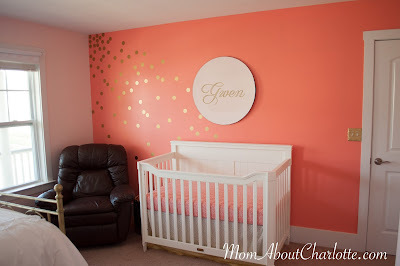 We decided to let the gender of baby number three be a surprise - which meant I was about nine months behind on decorating the nursery when we found out at 41 weeks that we were welcoming a little girl. 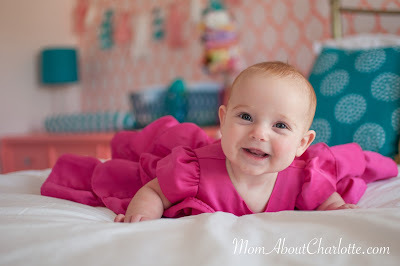 There was much excitement over the dresses, giant head bows and of course the chance to make a super girly nursery. We chose a gold, coral & teal theme for her room, but I was on a budget so I used many DIY's and coupons to give the room a custom look. 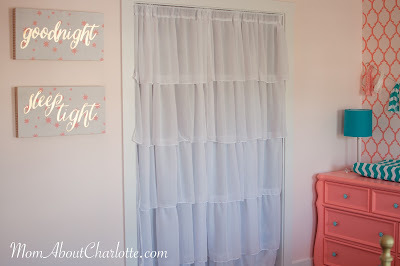 We had done our first daughter's room in pinks, so I wanted something that had the brightness of a pink but wasn't pink. 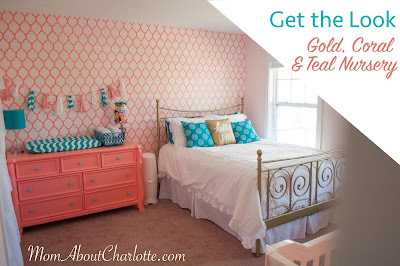 I fell in LOVE with coral, specifically Benjamin Moore's Old World, and decided to pair it with gold and teal accents. The coral color was perfect, but getting the paint for a reasonable price was tough because I didn't want to spend nearly $50/gallon at Benjamin Moore. Ultimately we chose to have Coral Gables from Benjamin Moore color matched and mixed at Lowes for about half the cost. The color came out closer to Benjamin Moore's Old World, which was just what I was hoping for. I painted the dresser that we got for $200 from a local store. 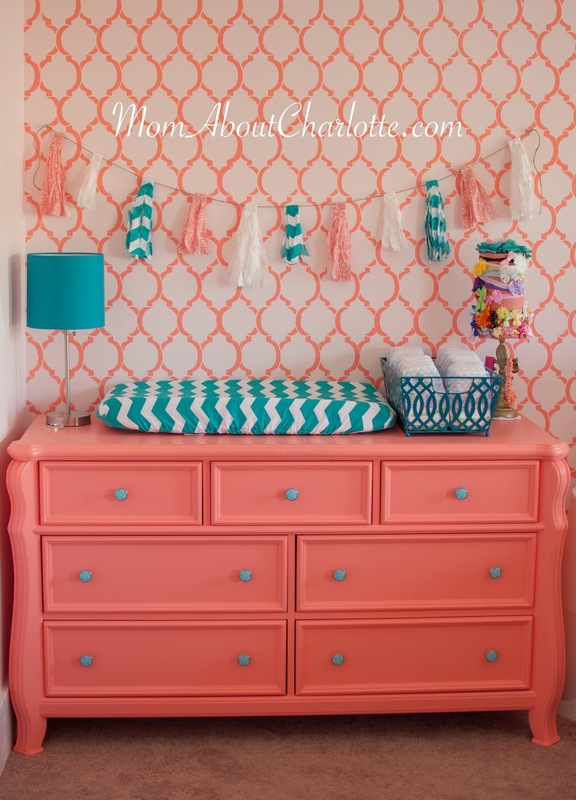 My advice is to sand just the top of the dresser, and use a primer on the rest of it to save time. We purchased the teal drawer pulls at Home Depot for about $2.50 each. 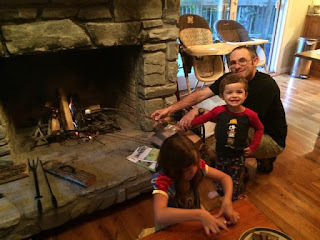 I enlisted the DIY's to reduce cost and add the custom look I wanted. Finding the right color coral was far too hard because I would have had to order online and at a much higher cost and doing it myself. 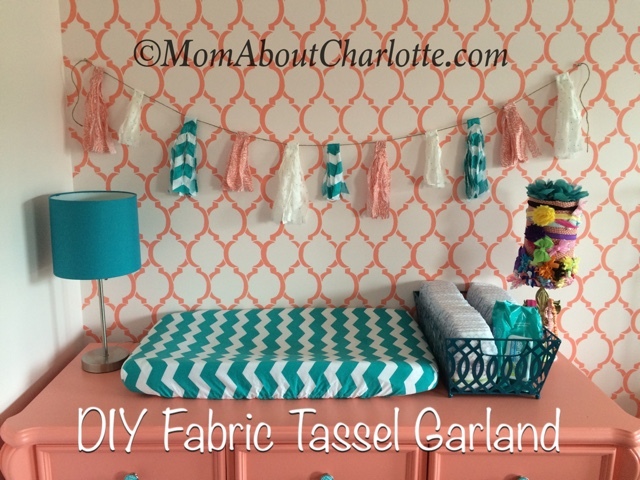 I made the diaper changing pad cover, the crib sheets, the crib skirt, headband holder, and the fabric tassel garland (all DIY's linked later). We never added closet doors in this room when we bought the house because I couldn't decide on what I wanted there. Ultimately I think we're going to hang antique barn doors, but finding antique looking doors that fit the space has proven to be difficult so I'm using frilly drapes in the meanwhile. Here she is. My little smiley sweetheart. We all agree that she's just been the happiest little baby we've met, and our family is perfectly complete. Drawer pulls $2.50/each at Home Depot $23 total. Lamp - from my mom from who knows where $free. 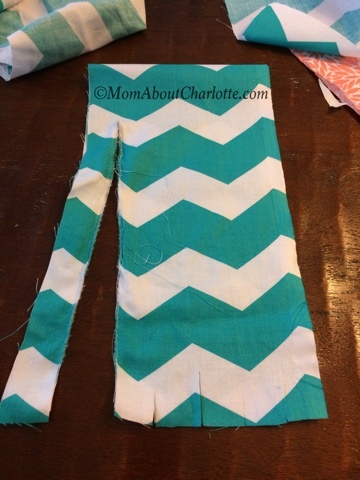 Diaper Changing Cover: Chevron teal and white fabric from Hobby Lobby here. $8 for 1.5 yards (on sale) DIY here. Crib Sheet: Fabric from Mary Jo's Cloth Store (aka cloth heaven - the only place I was able to match this coral) $9/yard x 2 =$18 DIY here. Crib Skirt: Falling gold dot fabric for crib skirt from Mary Jo's Cloth Store. 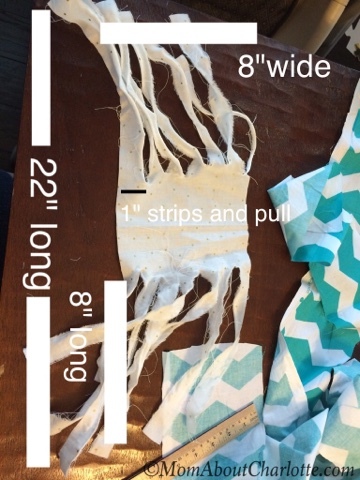 $11/ yard x2 = $22 DIY for a No Sew Adjustable Crib Skirt here. Fabric Tassel Garland: ($0 using scraps) DIY tutorial here. Headband Holder: $5 for fabric DIY tutorial here. 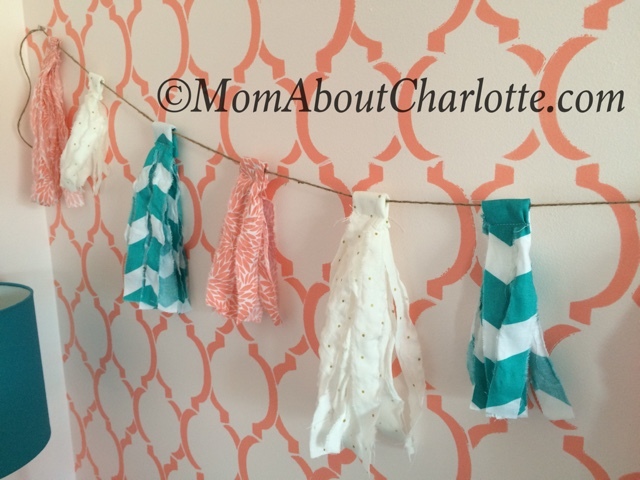 I was looking for an inexpensive easy DIY craft to add some texture and pops of color to the wall I had stenciled for our baby's room. I had done a pendant garland in our son's room, and I loved the look of it - but wanted something a little more feminine for her very girly nursery. I read a few tutorials on Pinterest and ultimately came up with a version of my own. 1. I used two different sizes of scrap fabric. The big ones were 22" long and 8" wide. The small ones were 12" long and 7-8" wide. I purchased the gold and white fabric and the coral fabric at Mary Jo's Cloth Store in Gastonia, NC for $8-$9 per yard. That place is not to be missed if you live locally I couldn't believe all the options they had of my hard to match coral color. The teal chevron fabric was purchased at Hobby Lobby on sale. 2. I folded the 22" fabric in half, and cut snips at the bottom 1" in width. Then I pulled them 8" leaving 3" for folding. 3. 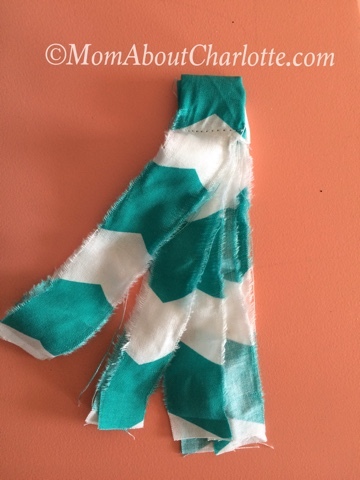 Fold over and secure with stitches. 4. String twine through the pocket you've made and hang. If you've been uptown recently you've likely noticed the beautiful Charlotte Knights Stadium just a few blocks from Trade and Tryon. A few weeks ago a large group in our neighborhood (180 of us!) were lucky enough to catch a game in the Knight's new digs. Although I'm not a big baseball fan, I found the vista of the field and skyline in concert with an entertaining ball game to be well worth the price of admission. We were lucky enough to enjoy the game during one of Charlotte's many nice (although it threatened storms in the distance) evenings. The seats were comfortable, had a good view of the action and our son enjoyed eating (crushing) peanuts while we participated in the wave, singing take me out to the ball game and the 7th inning stretch. Baseball games typically equal enjoying a few cold beverages. My husband and I were stoked about the beer selection - it wasn't just your typical domestic drafts - they had many local micro breweries on tap. There are still several games to catch before the end of their season - Thursdays are "Thirsty Thursdays" with $3 small drafts and $1 sodas. You can buy tickets here. 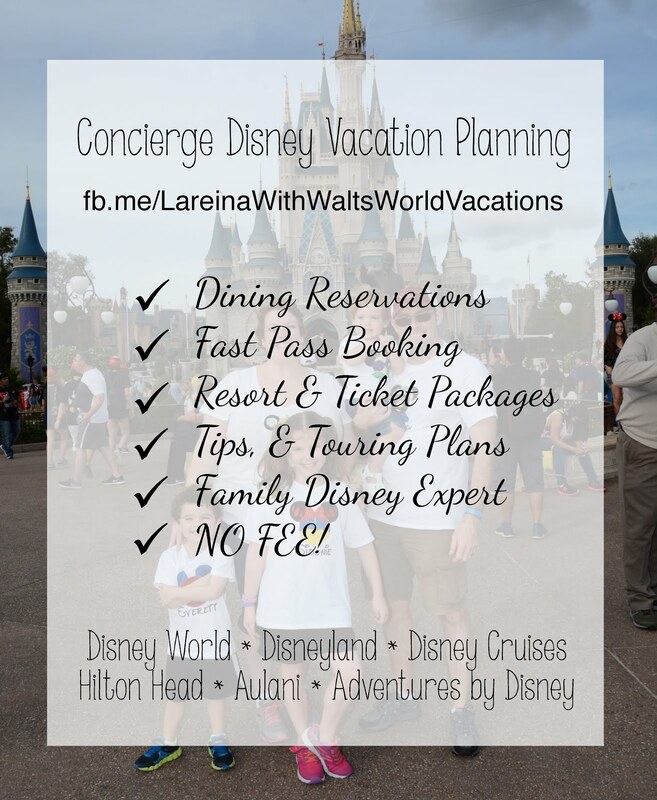 Looking for NO-FEE Concierge Disney Vacation Planning? 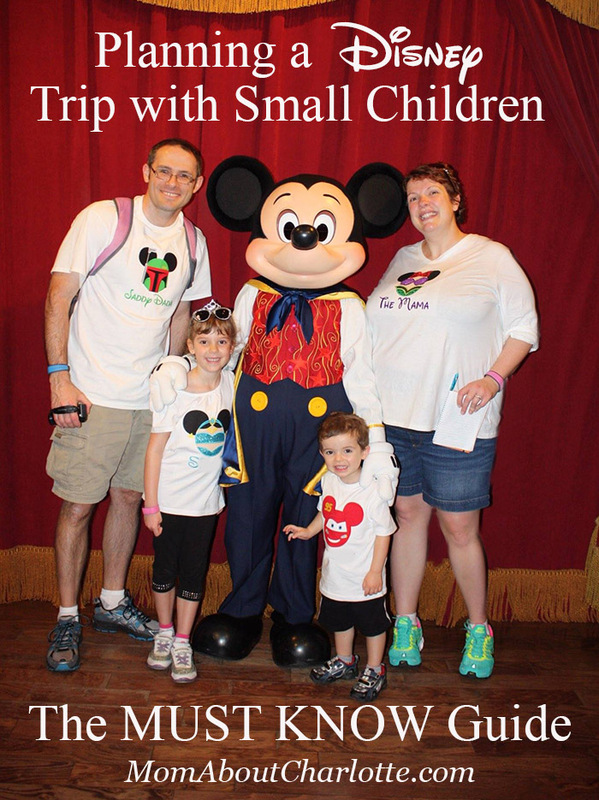 I'd love to chat with you about how to make your family's Disney Vacation (World, Land, Cruise, Aulani, Hilton Head, Adventures) seamless, fun (even for you Mom!) and full of life-long memories. Email me at Lareina@WaltsWorldVacations or on Facebook at Lareina with Walt's World Vacations. 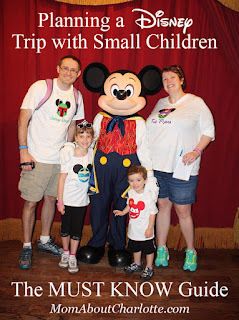 The mention of the Mouse brings a smile to my face, and my mind cues the montage reel of wonderful family memories. Disney World brings out the kid in me - the excitement, the anticipation and the screaming fun - from childhood to adulthood it has been a constant in my life. I've found the only thing better than going to Disney myself has been bringing my kids there. It's magical see that same wonderment through their eyes, and to create new family memories. 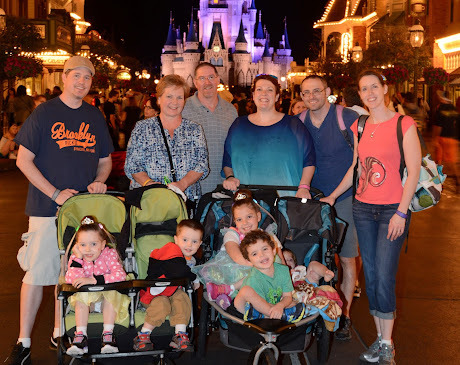 However, as magical as Disney World is - with two kids (our maiden voyage) it's also a lot of work and planning. 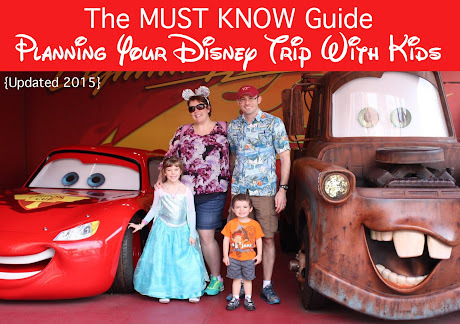 You can still have fun and enjoy the magic if you sprinkle some pixie dust on the family - and follow my 'Must Know For Planning - Disney World With Kids' guide. 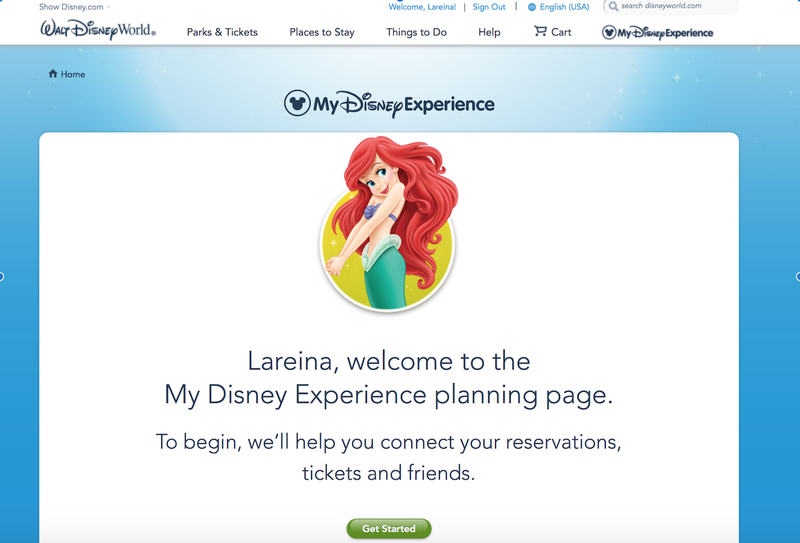 I've found that my preparations for Disney World were akin to studying for a (fun?!) final exam, and the preparations start 180 days in advance. Familiarize yourself with the maps of the parks, know where the rides are, check out the menus for restaurants (especially if you have picky kids), learn which rides your kids are tall enough to ride, and which they might want to do vs. avoid (some are a little scary). Having a working knowledge of the layout of Disney is very helpful. 2. Decide if you're staying onsite or off site. There are pros and cons to each. My favorite place to stay at disney at the moderate level cost is Port Orleans French Quarter. They have Queen sized beds and I love that it's one of the smaller resorts and has an adorable New Orleans atmosphere. Pros - parking is free at the hotel and at the parks, you're closer to the park and can use their transportation around the parks, although you can use it if you stay off site too. You are eligible for packages like free dining when it's offered, some feel it's fun to not leave the Disney campus and live in the themed Disney ambiance. They have adorably themed pools and the customer service is top notch. They don't charge a resort fee on top of their advertised room fees. Cons - much smaller rooms/lodging, typically have the whole family sharing sleeping quarters - which we have found to be awful with small children. No kitchens, no washer/dryers in rooms, only a public pool. Depending on the hotel you stay at, it can be a hike from the parking lot to your room. Pros: Lower cost, more room, private pools, washer/dryer, full kitchen, parking directly in front of the hotel, can reduce food costs by cooking in full kitchen. Cons: A little further from the parks, you need to rent a car or drive there, must pay for parking $18 a day (last I saw) at the parks (or do what we did below). Lose the Disney ambiance. You aren't eligible for free dining packages. We've stayed in a hotel, a 2 bedroom villa and a rental house. The only down side was paying for parking, which we avoided by parking at the Boardwalk and eating breakfast there, or grabbing breakfast at the Polynesian and parking there before going into the parks. I'd rather pay $20 for a quick breakfast at the Polynesian and take the monorail into Magic Kingdom versus $18 for parking at the park.. You can walk right in the back side of Epcot entering near England with about a mile walk from the Boardwalk free parking. Hotel: I wasn't thrilled with the hotel because they charged a "resort fee" and made you pay for parking at the hotel, there wasn't space in the room and you had to pay for parking at the parks as well. I wouldn't stay at an offsite hotel again with small children. 2 Bedroom Villa: We stayed most recently at the Vistana Resort and really loved it. The cost was reasonable, we had plenty of room including separate sleeping quarters for us in one room and the kids in another, there was a huge jacuzzi tub I went in EVERY night. After a long day in the parks (and being 34 weeks pregnant) that was an amazing bonus for my feet and body. The beds were comfy, pool was large, it was very clean, we had a fully stocked kitchen and washer/dryer right there. It was on the 1st floor and we could park directly outside the door - no additional schlepping was a bonus at the end of the day. It wasn't that long of a drive into the Disney parks, approx 15min. Their shuttle service to the parks is not good though. Rental House: We rented a house called Story Time Castle when we had 3 families (3 kids) going and that was a nice experience because there was plenty of room for everyone, there was a kitchen to help reduce the cost of eating out and prepping lunches to bring to the park, there was a washer/dryer and a princess themed room with two twin beds and a cars themed room with two twin beds, plus 3 other rooms for the adults with Queen or King sized beds. Overall there was tons of room and we loved that we could put the kids to bed at night with a monitor and go spend time floating in the private pool off the kitchen. It was about 15 minutes from the parks. The only negative was that there were bugs on the 1st floor, which I understand are hard to avoid in FL, but overall we felt it was pretty clean other than the bug issue in the bathroom on the 1st floor. I used the crowd estimator from http://www.easywdw.com/ to determine which parks would be best to go to on each day of our stay, and it seemed to work well. You can also decide which weeks to visit based on the estimated crowd capacity. If it's a holiday it's going to be busy. If you can go in January (after the first week) that is the bees knees, low crowds and non-melting weather. I had a calendar app I used to keep track of where we were going to be when, the show times and the time of our FP+'s and reservations for dinner/lunch. I also read several blogs that suggested touring plans for each park. Make reservations for experiences (like the Bippity Boppity Boutique) and Royal Table as soon as possible because reservations are limited and can be impossible to get if you wait. You can make both 180 days in advance if you are staying on site. 5. 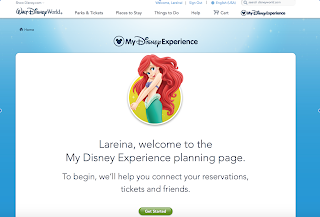 Familiarize yourself with My Disney Experience website & download the app for your smart phone. The problem in a nutshell? It's paaaainfully slow, has hiccups, service outages, and the FastPass+ system was a clusterF even for my computer savvy self. Eventually the website and I found some common ground and it 'worked' for me once I learned its bad habits. It has gotten slightly better in the last year or so. You can always change them if you need to, but make them for the popular rides even if you think you might change them. I found that as long as your selected time slot hadn't begun you could make changes. 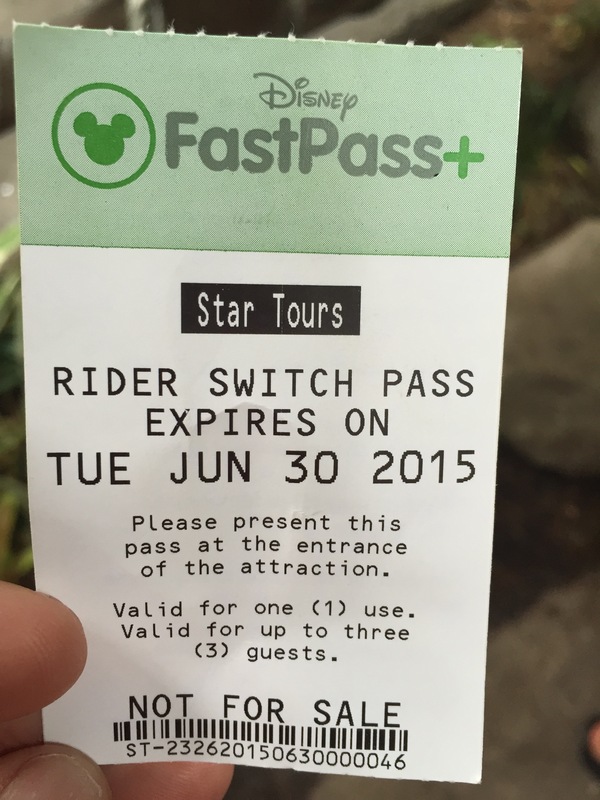 However, FastPass+'s (FP+) are limited and availability changes throughout the day. If you couldn't get the ride you wanted earlier in the day try again as the day goes on from your smartphone. Make your FP+'s for earlier in the day if possible, once you have used your allotted 3 per person you can add FP+ if there is availability one at a time at the kiosks throughout the park. One of the best FastPass+ options I used was for the Electric Street Parade at Magic Kingdom. They have a roped off area for the FP+ reservations, and we got lucky and were able to sit on a bench in front of the castle and watch all the floats go by, we stayed in our seat and were able to watch the fireworks that followed. Pure Disney Magic on our last night there! 7. If you have small kids, take advantage of their Rider Switch Service - and read my hint on how to maximize this service below. This service is only for certain rides that have height restrictions where part of your party can't/doesn't want to ride. Basically everyone goes to the ride's entrance and you tell the cast member that you need a rider switch card. Dad and whomever wants to ride get on the ride (you can use your FP+ or this) and then Mom waits with whomever can't/doesn't want to ride. Dad et al. finish and then Mom plus 2 people can use the rider switch to get into the fast pass entrance to ride. There's a special trick to working it to it's full advantage along with the FP+ system. 1. Players: Mom, Dad, Sis, Bro & Lil Bits who can't ride. 3. Dad&Bro get a rider switch card and use their FP+ at 9am, Mom&Sis wait with Lil Bits. When Dad&Bro are done riding Mom,Sis&Bro use the rider switch card (good for 3 people) to ride while Dad stays with Lil Bits. 4. Mom&Sis get a rider switch card and use their FP+ at 10am, Dad&Bro wait with with Lil Bits. When Mom&Sis are done riding Dad,Sis&Bro use the rider switch card (good for 3 people) to ride while mom stays with Lil Bits. 5. This way Mom&Dad both get to ride 2 times and Sis&Bro both get to ride 3 times - all with only using a total of 4FP+'s! 8. Buy extras for your digital stuff. Remember to charge your electronics, and buy an extra memory card for your camcorders and cameras - they will come in handy. Bring a plastic sealable bag for your electronics just in case - and an extra boost of power for your smart phone if you can get one. Note that Disney has banned selfie sticks. 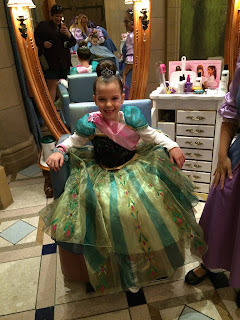 Have fun and check out my other Disney Tips Blogs below! Thomas the Train was coming to Tweetsie Railroad in Blowing Rock, NC and our little man E is the perfect Thomas-loving age (2 1/2). We packed up the gang and headed up the windy, narrow and beautiful roads to Blowing Rock, NC for a visit with Thomas and to experience the adventures at Tweetsie. We rented a cabin called Almost Heaven, it was clean, spacious and comfortable - and had everything you could need for 3 families. The only negative was the drive way, we bottomed out when we arrived as it is very dipped, but there were other parking spots and we would definitely stay there again (we brought the high chairs). 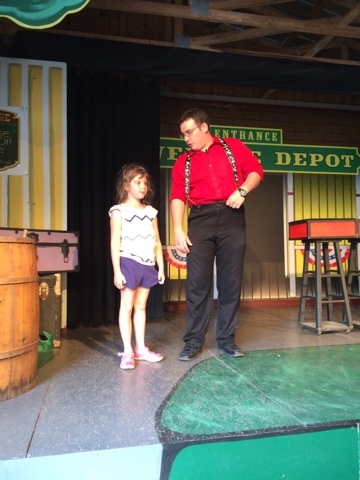 We scheduled one day at Tweetsie and arrived around 9am a little after it opened on a warm June morning. 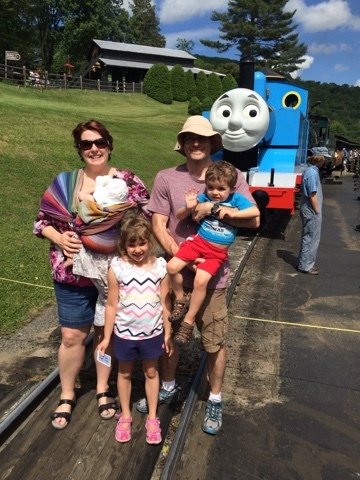 Our ticket to ride Thomas was at 10am. 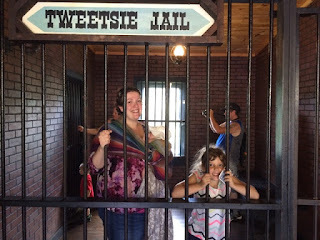 We organized our large group of 6 adults and 5 kids (ages 6, 3, 2.5, 1 and 3 months) and headed up the hill to the Tweetsie entrance, where they had one person taking tickets. We waited about five minutes to enter with anxious little ones chomping at the bit to get in. Once inside we decided it was best to spend about 30 minutes waiting for the train so we could sit further back from the engine. There was lots of soot that came out of the train's smoke stacks and we didn't want to be directly in the wake of the cloud of black. Then it was our turn to ride and the kids were excited as we hurriedly gave them all another coat of sunscreen and loaded into the cart. We steamed forward and were able to see the lush green scenery. About half way through the ride we came upon their train show, which was pretty awful. The actors seemed to have already given up by 10am and may as well have just been rolling their eyes as they gave their lines in a monotone voice. The kids didn't notice, but we were disappointed in how poorly these "actors" acted out the script. 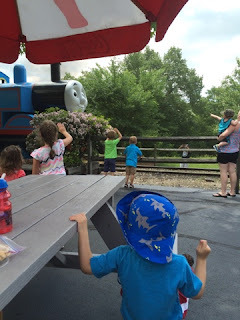 Then onward we steamed for the rest of our 30 minute journey on Thomas. We headed out to grab some lunch at Sparky's Southwestern & BBQ and felt the food was reasonably priced and tasted better than we expected. Finally it was time to hit some rides, and what I mean is wait over an hour for each crappy carnival-like ride in the hot blazing sun. But first, time to climb another big hill while pushing the double stroller. I didn't realize that Tweetsie is actually on the side of Mount effing-Everest! I've been to Disney World more times than I can count on my hands and I've never waited this long for a ride before. Once we had spent far too long to ride the turnpike cruisers and ferris wheel we had a shorter wait for the carousel and Tornado. Then we hoisted the kids up yet another much larger hill because the chair lift wasn't working. 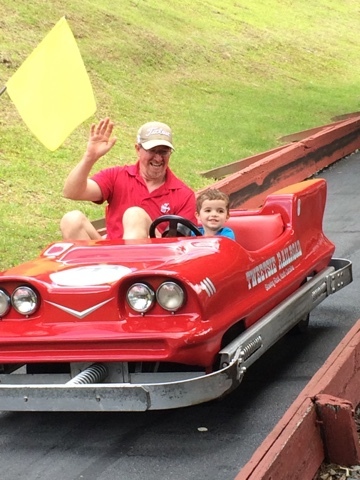 Once we arrived at the summit of Tweetsie and tipped my husband the sherpa, the toddlers enjoyed going on the boats and planes - which were too small for our 6 year old to ride. We watched the magic show, which was actually quite entertaining, S got picked to be his assistant and score - we were in the shade! Then the kids and grandma and grandpa waited about 30 minutes to ride the mouse mine train while the dads went to wait in line for 15 minutes to get us water. In summary, Tweetsie was a mountainous hot mess with rides we could have experienced at the local carnival. For now this "blast from the past" will be kept in our past. After our long hot day we enjoyed an awesome meal, with what my husband proclaimed to be the best fried chicken he's ever had, at The Daniel Boone Inn. Honestly everything was delicious and the servers were outstanding, a must try for the area. You'll want to get there early because the line got quite long after we arrived at 4:00PM on a Saturday, and they don't take reservations.